On Thursday evening we have decent looking card from Leopardstown ,with the feature race the 1 mile Listed Glencairn Stakes at 6.50 . 10 runners declared for 1 mile listed contest ,on ground described as yeilding .The three main contenders look to be Brendan Brackan ,Marshal Jennings & Making Light . 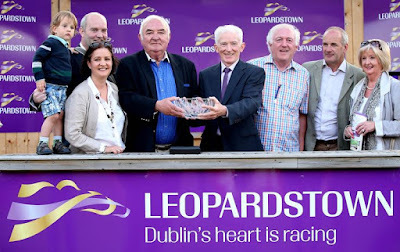 BRENDAN BRACKAN : 8 year old gelding , winning 8 out 34 on turf .Goes particularly well with cut in the ground , including winning three listed contests over this trip . Made impressive reappearance in March ,winning the valuable Irish Lincolnshire at Naas ,off mark 105 (carrying 9 stone 12lb) .No disgrace finishing third of 4 in 10F group two Moresbridge Stakes ,behind the top class Minding .Will be suited returning to listed company ,with ground conditions sure to suit . MARSHALL JENNINGS : 5 year old gelding ,winning 2 out 22 ,consistent sort ,though not the best strike rate .Had some fair form last season , including finishing close second in Listed Ruby Stakes at Killarney in August .Also finished good second over C&D in Listed Heritage stakes at Leopardstown in April on soft ground .Each-way claims,though not easy to win with . MAKING LIGHT : 3 year old filly ,winning 2 out 2 on turf,including winning the group three Killvullan stakes at Leopardstown in October ,that form hasn't really worked out ,though still looks open to plenty improvement after just three starts .Interesting contender . VERDICT : BRENDAN BRACKAN is proven winner in this grade.Looked good as ever when winning the Irish Lincolnshire in March ,when conceding weight all round ,that was decent performance under 9 stone 12lb . Looks sure go well returning to listed company ,with ground conditions also in his favour .Odds around 3-1 look solid value .